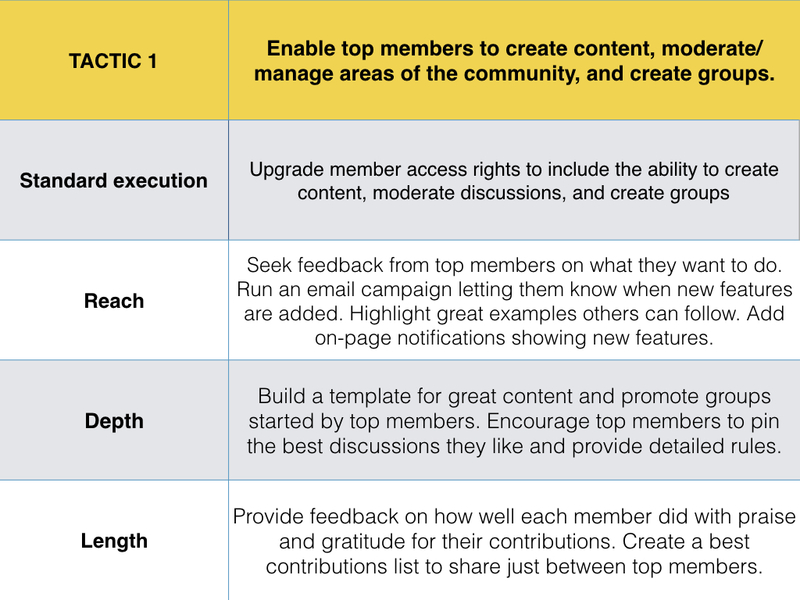 Writing an online community strategy from scratch is hard, especially if you haven’t created many strategies before. Too many online community strategies don’t logically connect the ‘what you’re doing’ with ‘what you’re trying to achieve’. Having written and reviewed over a hundred community strategies from brands big and small at this point, we see many of the same problems occurring. Let’s try and tackle the process in a little more depth. This usually takes 8+ weeks to complete. These strategy templates might also help. Be skeptical of advice which begins ‘list your goal’. 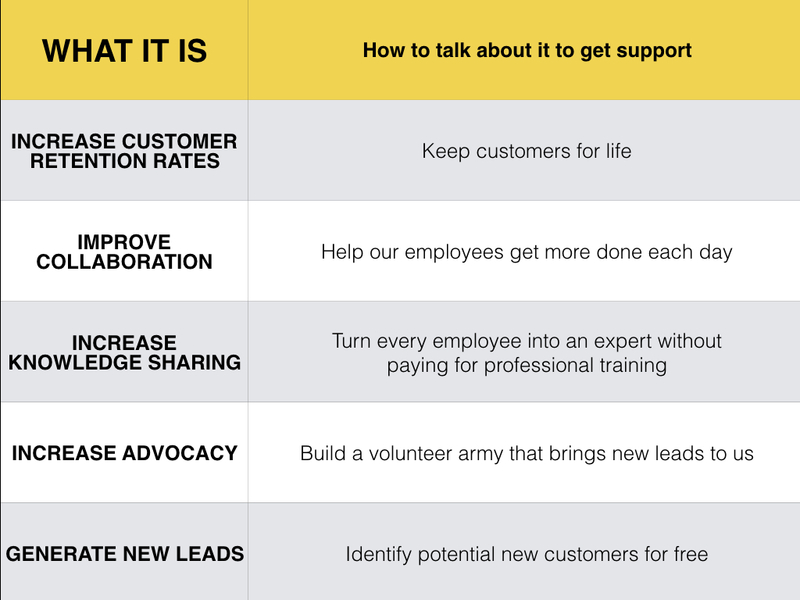 Uncovering and getting support for a goal takes time, but saves time in the long run. No-one questions your value when they’ve already agreed what it is before you begin. If you find yourself being measured against engagement, you haven’t properly established your value. New communities should start with a single, clear goal agreed by all relevant stakeholders. Don’t rely on just your boss to fight for you. Your boss might leave or lose support. The key to setting a goal is gaining support. The key to support is seeking to understand before being understood. 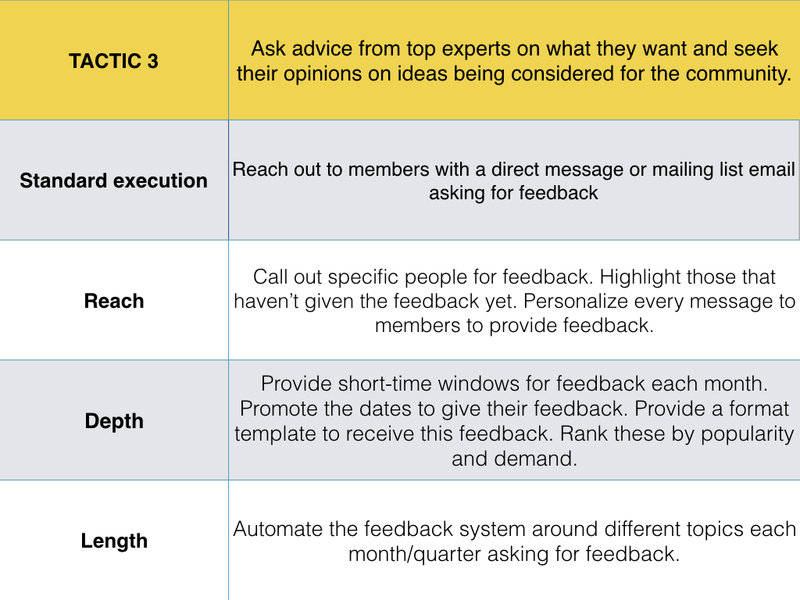 Attend meetings of product teams, marketing teams, PR teams etc…understand what they value and ask for their feedback on how the community can help. Now design a goal to match that is as closely connected to business value for one department as possible. Also, realize how you talk about that goal matters. Framing a goal matters. 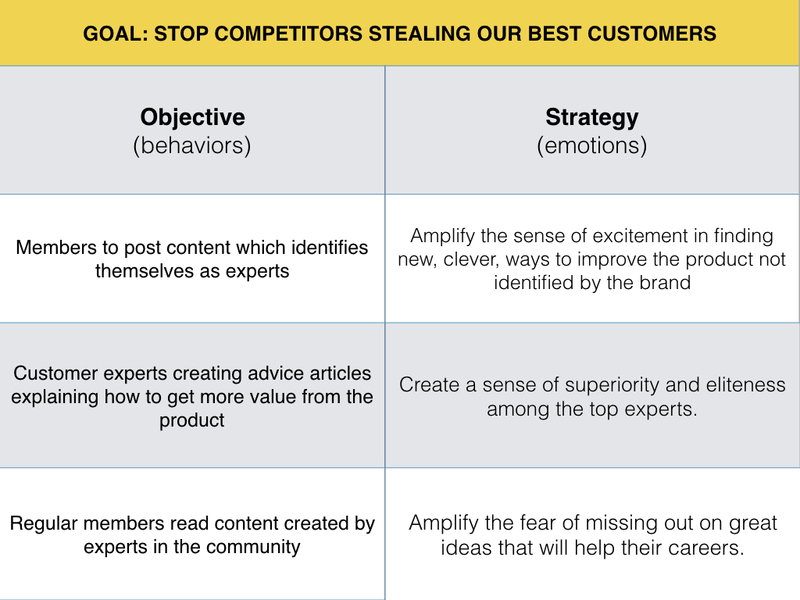 There is a big difference between framing a goal as increasing retention and framing a goal as stopping competitors from stealing your customers. Which do you think will get most support? You can also frame it as a gain. The point is when you talk about it internally that you use emotive language. Remember people are persuaded by emotions, not rational thought. Make sure you do a detailed stakeholder analysis here. You need to know how to keep the main stakeholders engaged and informed throughout the community lifecycle. Goals are the value your community gets from the community. These don’t have to be directly linked to a financial return, but you want them as close to a financial return as possible (retention is better than loyalty here). Objectives are the behaviors members need to perform for you to achieve your goals. These should be really specific and logically help you achieve the goal. If you have an existing community, you can run a multivariate regression analysis (or an experiment) to see which behaviors most drive your goals today (e.g. if number of articles read is closely correlated with increased retention rates, you might prioritize reading articles over creating them). At this stage you’re making testable hypotheses. 1) Customer experts creating content explaining how to use the product in new and innovative ways. 2) Regular members reading content created by customers experts. 3) Members engaging in activities which helps identify them as experts. 1) Articles created by designated experts. 2) No. of members reading articles created by experts. 3) No. of designated experts (e.g. above a threshold). You want benchmarks against these metrics, not generic engagement goals. Notice how these KPIs aren’t borrowed from another community but completely unique to your community goals. This is how it should be. Borrowing someone else’s measurements is to measure someone else’s strategic efforts. 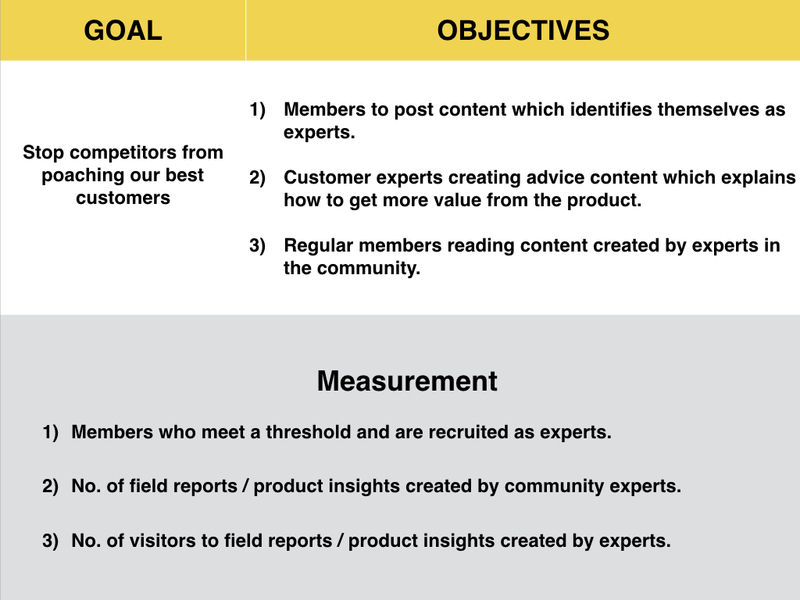 Now we have a clear goal, objectives to achieve that goal (notice, also, how connected those objectives are), and we know what we’re going to measure. Remember you will need to check that your assumptions (members learning to use the product better increases retention) are accurate later. There are other channels (superior customer service) which may work well here too. Make sure your boss and colleagues know what behaviors you’re encouraging. They need to understand how it all connects. A strategy is your approach to driving the above behavior(s). Your strategy is based upon the emotional appeal you’re going to use. A huge mistake here is to try to persuade people with facts. Always appeal to the emotion if you want people to take action. Every tactic you select later should be designed to amplify or reinforce the emotion that will move people to action. The best way to uncover your strategy is to interview as many members who already perform this behavior and ask what motivates them. Go deep to uncover how they feel when performing the behavior (notice too, how a community strategy is about engaging deeply with the outside world). You should see the emotional appeal in each element. At this point, we have our goals, objectives, and strategy set. We should only be executing on tactics which help achieve that goal. Next, we want to develop our tactics. Most community professionals are trying to execute on far too many tactics. If you’re feeling burnt out and overwhelmed, that’s not a time-management or self-care problem, it’s a strategy problem. You’re trying to do too many things because you don’t know which activities matter. A strategic plan should help you identify just the 3 to 5 tactics which really move the needle and provide you with the time and resources to execute them extremely effectively. Every tactic must amplify the strategy. 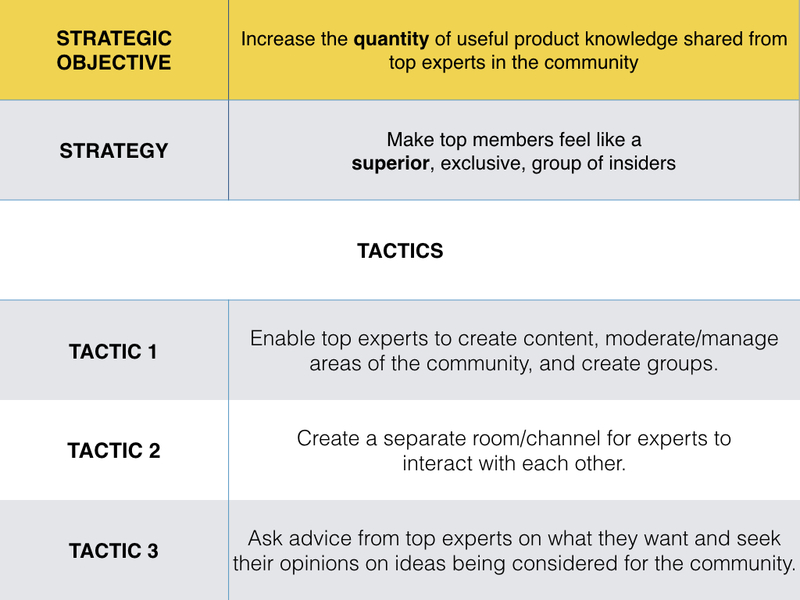 Don’t select tactics just because other organizations use them. 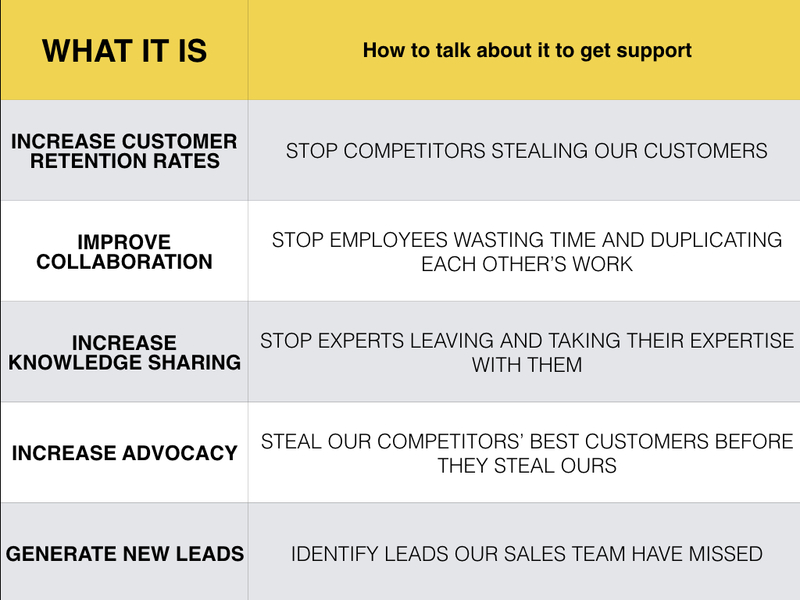 They’re chasing engagement and kudos from their peers, you’re chasing results for your company. If you’re not sure which tactics amplify the emotion, think of situations when you felt that emotion (e.g. when did you feel part of a superior elite group?). How might that translate into a community (e.g. customer council for brand, moderation/content creation rights, having your opinion sought by the community manager)? Let’s take an example of one strategy above. You can do this for each of the 3 strategies (shouldn’t be more than 3) you plan to execute. Now plan how you will maximize the reach, depth, and length of each tactic. I’m constantly amazed how many people come up with great tactics but do little to get the most out of them. Often the community isn’t aware the activity occurred, let alone making it easy for members or lasting for a long time. Most tactics fail because they are so badly executed. They don’t reach enough people, don’t change behavior, or don’t last for a long time. If you’ve ever spent a long time working on a PDF eBook which people downloaded once and barely read, you know what we mean. Reach is what % of the audience the tactic will reach, depth is the extent it will change behavior, and length is how long it lasts for. Notice how most people might approach this and how you (with your additional resources) can now do it much better. This is what happens when you cut down the number of tactics you’re working on to a core few. Once you invest more time into a tactic, you can improve your results considerably. Again, great tactic – but once you can upgrade to make sure you get as much from it as possible. Now you want to take each of these steps and schedule them in an action plan (template). Highlight when they will be done and who will do them. Estimate the hours each will take. At this stage, you will need to revise your expectations to make sure you can execute on these tactics. At this point, you should be relatively set to pursue a logical strategy to achieve your goals. You should have internal support, know what behaviors you need to encourage, know what emotion will drive each of those behaviors, and have identified tactics to amplify that emotion. You should also know how to ensure each tactic is as effective as it can be and scheduled each tactic for the next 3 months. Most importantly, if you get the strategy process right, most of your problems fade away. That sense of burnout, feeling overwhelmed, lack of internal support etc…these are all strategy problems you solve along the way. Remember to get a copy of the strategy templates and join our community if you have questions.